Jolina Magdangal and Mark Escueta are now officially married couple as they exchanged their vows in a garden wedding ceremony held at around 5 p.m. today, November 21 at Splendido Taal Golf and Country Club in Tagaytay. 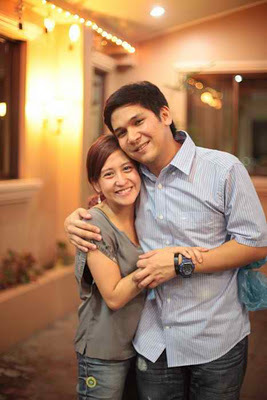 Among those who witnessed their union as a married couple are few of Jolina and Mark's family, relatives and close friends from showbiz and music industry like Rachelle Ann Go, Jonalyn Viray, Aicelle Santos, Maricris Garcia, Diva Montelaba, Gian Magdangal and wife Sheree, Anne Curtis, Tuesday Vargas, LJ Reyes, Max Collins, Paolo and Suzi Abrera, Rhea Santos, Wilma Doesnt, Nikki Valdez, Kaye Abad and Direk Dante Garcia who are all wearing a Bohemian-inspired outfits. The wedding sponsors include Gibo Teodoro, Ronnie Puno, Franklin Drilon, Celia Rodriguez, Mel Tiangco, Arnold Clavio, Jaya, Beverly Vergel, and GMA-7 executives Lilybeth Rasonable and Redgie Magno. The bride's special friends in showbiz like Judy Ann Santos, Angelika dela Cruz and Kyla acted as bridesmaids. Former Rivermaya vocalist Bamboo Mañalac, was supposedly one of the 19 groomsmen but failed to attend the wedding. "Ikaw ang pinakamagandang regalo ni God. "Lahat ng nandito, lahat ng in-invite natin dito, alam nila kung gaano kita kamahal." Jolina said to his husband. "...Ikaw ang buhay ko. Mula ngayon, para sa iyo ang lahat."